You are here: Home / Recipes / Main Dishes / Spicy Vegetarian Chili – perfect for game day! 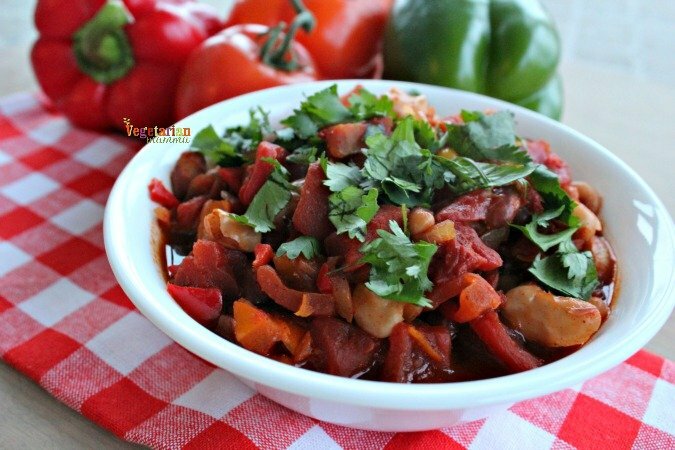 Spicy Vegetarian Chili – perfect for game day! Call the fire department, because you might need a fire extinguisher. This spicy vegetarian chili is HOT! This chili is not your average chili. This spicy vegetarian chili is HOT and will get you fired up to cheer on your favorite team on game day! Game days are always important at our house. We often have friends and neighbors over to watch our favorite teams on game day. Of course, we always have a great spread of food for the football fans. This spicy vegetarian chili is a crowd pleaser. Are you a meat eater? After two bites of this chili you will forget it is vegetarian. This spicy vegetarian chili has a secret weapon. The powerful HOT flavor comes from El Yucateco Hot Sauce. For this particular recipe, I selected the red sauce. The red habanero hot sauce is made with fresh red habanero peppers, tomato, and select spices and seasonings. The red habanero sauce is considered an all-purpose sauce and packs more kick then the average hot sauce. It has far less vinegar, so you are going to taste those spicy habanero peppers! I found the El Yucateco Hot Sauce at Meijer in the condiment aisle. Super easy to find and affordable. If you want even more of a kick, I would suggest using the GREEN sauce! 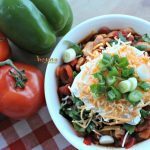 Spicy Vegetarian Chili is actually vegan to start with, however when you pile on the toppings it can easily become full of dairy. If you are vegan or need to avoid dairy, you can simply top the chili with fresh cilantro, dairy-free sour cream, dairy-free cheese and green onions. If you are looking for more game day food ideas, you need to check out our Party Style Bean Dip, Buffalo Tofu Bites and Loaded Plentils Nachos! 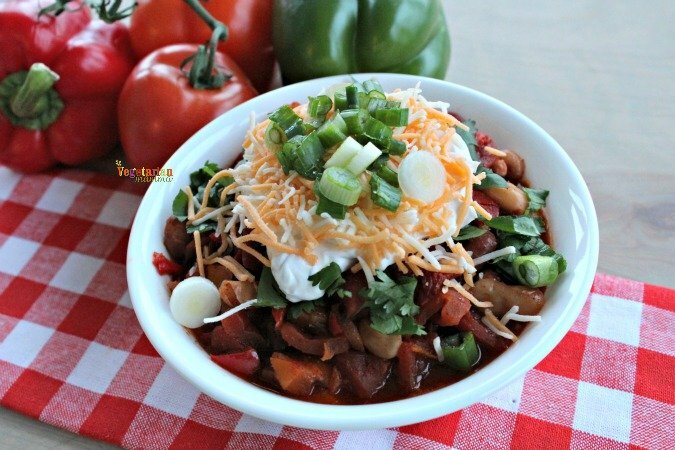 Spicy Vegetarian Chili - perfect for game day! 30 oz of diced tomato with onion often called "chili ready"
Over medium heat in a stock pot, heat the olive oil. Add in onion and bell pepper. Saute until soft. Add in remaining ingredients except cilantro and garnish items. Turn off heat, stir in 1/2 cup of fresh cilantro. I love the ease of this chili. It is literally a dump and forget type of dish! Alternatively, if you cannot use a crockpot you can bring to a boil. Reduce heat and simmer for 20 minutes. Remove from heat, stir in 1/2 cup of fresh cilantro. Garnish and enjoy! I want to know MORE! Check out the official El Yucateco page. There are so many sauces! Which sauce would you like to add into your spicy chili? While you are on the El Yucateco page, check out the gear store! 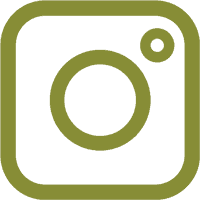 They offer some pretty cool gear and apparel for men and women! I love the idea of having a vegetarian chili! I bet the calorie count is quite reasonable. But the best part is making it in the crock pot – I love using my crock pot! Yes, aren’t crockpots a life saver! Love them and all they can do for us, while we sit back! This sounds like a great chili!! I love making a big pot of chili especially in the winter time! I have never tried these hot sauces, even better this is done in the crock pot I use mine daily. Thanks Tammilee! 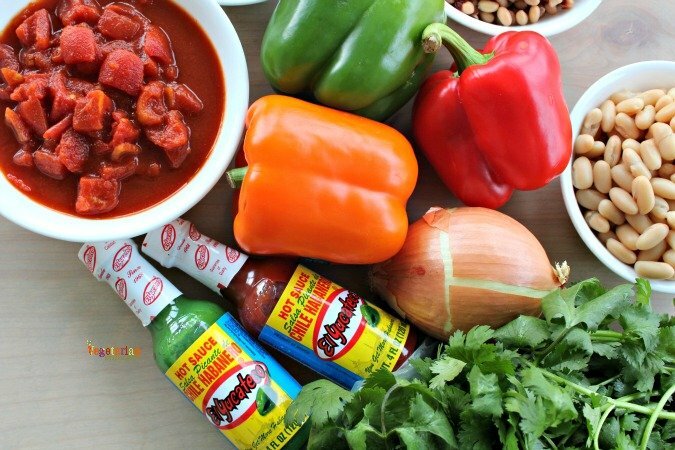 We love hot sauces and this crockpot chili is fabulous! Isn’t the crockpot great! I love mine! Yes, I agree! Love spicy chili for game day! That is almost too hot for me. But I like my beans. I will need to add a little more. You can also make it less hot with the addition of sour cream! That makes it more manageable if you don’t like it super spicy! Mmmm, I love me some chili! And the fact that we can make this in a crock pot is a plus! Thanks for sharing the recipe Cindy, looks yummy! Love me some chili too! And the crockpot is a bonus! Yum! This sounds great. We don’t eat much meat here, so this is perfect. Yay! I hope that you enjoy! What a hot recipe. I love all the ingredients. And the idea of dump and run cooking certainly works for me. I have just read the recipe twice so I am ready to make something like this for myself. Thanks. Sounds too hot for me but bet my husband and son loves it. I’m not a vegetarian but don’t have to have meat in everything. My chili has ground chuck but tons of beans. My husband is the lover of hot sauce in my family! We usually bring some home from places we visit on a cruise – even one from “Hell”. I’ve saved this to try. That is fun! What a neat way to remember the places you’ve traveled too! My guy loves, loves, loves it super fiery. This is going to be a huge hit around here! By the way, vegetarian chili is the only way I make it. I just feel like all that protein power from the beans is good enough. I LOVE a good pot of chili and it makes great leftovers. Bean power is pretty awesome in chili! Lots of protein! That looks really delicious! I’ve been thinking about making chili a lot lately, it’s been too long. I’d especially like to try a vegetarian chili since I’m trying to eat less meat products. Awesome, that is perfect timing! I hope that you enjoy! Being from Texas, we love a good chili. I’ve never made a vegan one though. 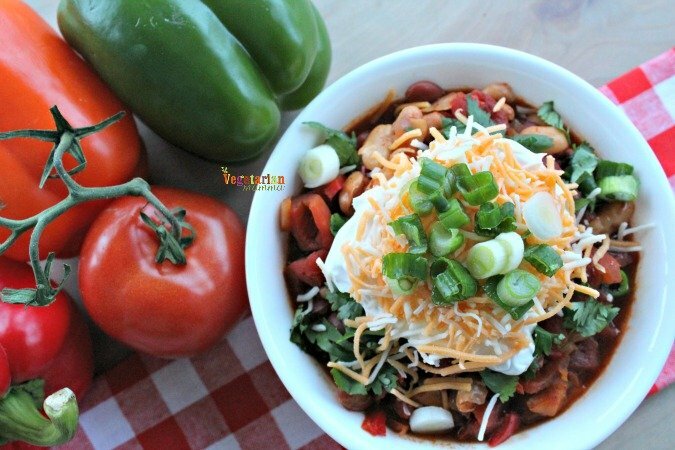 The pictures make this chili look like it’d be worth a try to go meatless! This one just maybe the perfect meatless one! You have to try! YUM! Mmm I love spicy foods, especially chili! This recipe sounds amazing – I am printing it out and hope to try it this weekend, thank you! I am trying to cut my red meat intake and this will help me still be able to enjoy chili. Yes, this will be a great way to enjoy chili, but without meat! YUM! I am a bean lover. I have to modify the recipe to meet my grocery stock availability but it is definitely going in to my “cook|| Savoury” board. A vegetarian chilli is such a welcome change. Thanks for pinning! I appreciate it! YUM! 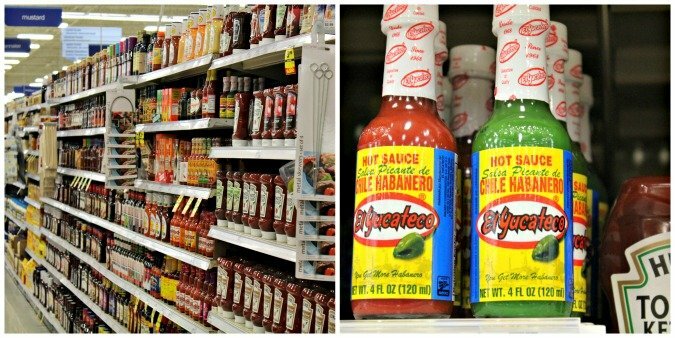 My husband always keeps El Yucateco stocked in the pantry for a kick of spicy! I love spicy stuff too, and have used El Yucateco to make grilled veggies with habanero sauce. Great flavor. Thanks for sharing your chili recipe! I’ve never tried El Yucateco Hot Sauce before, but I like trying different hot sauces. The chili look good, healthy and filling. I love how you’ve topped it in the last picture – cilantro and sour cream are my favorite things to put on chili. Now you have the perfect reason! YUMMO, yes cilantro and sour cream are so good together! I’m so excited about this post. My niece was recently diagnosed with celiac, and our family’s favorite chili recipe contains flour. Now I can hopefully bring chili back to our family meals. Thanks! Fantastic, I hope that you enjoy! What a great hearty wintertime recipe. I’ve never made chili before and this would be a great recipe to try. I would like to make extra to freeze too. Yes, we love to freeze ours too! This looks so good! I make chili about once a week and you’ve given me some new ideas to spice up my dish. I was just looking up vegetarian chili recipes yesterday! I love that this one uses blackeyed peas. This recipe sounds amazing. I love having chili, especially around this time of year. I do love spicy too, so I’m sure I’ll like this recipe. Chili is such a fall and winter staple at my house. I’m always looking for new recipes to up my game and love that this is a meat-free option to help me mix things up! Chili is such a staple in my house too! That is a lot of spice! I love the variety of pepper flavors in this recipe.